This album... or maybe this is not an album, the cover says it’s an Original Motion Picture Soundtrack... Regardless of what it is, Diabolical Masquerade delivered an absolute masterpiece incomparable to anything you’ve heard before. 61 tracks squeezed into 42 minutes most of us associate with a collection of hyper-fast, eardrum-molesting grind-core, but in reality “Death’s Design” is one of the most original black metal albums in the last few years. Of course it’s not all black metal here. Progressive black metal would be the closest genre label I could muster if I had to classify this album. Blackheim (Anders Nyström from Katatonia) with help from Dan Swano, a small orchestra called The Estonian Quartet and few other musicians, jump from one music style to another with such ease that attempting to find a description of all forms performed here is just insane. At one moment you’ll hear mid or fast tempos of black metal that will go into ambient, oriental or just progressive metal making you standing speechless and wondering what the hell just happened. Don’t let the number of tracks fool you because most of the time you won’t even notice the smooth transitions from one to another. A mix of clean and black metal vocals, which in my opinion are one of the best in this genre, are perfectly composed to the underlying music. Influences from the members’ original bands are well noticed and are perfectly arranged so with the blend of black metal speed and aggression create something new and utterly unique. Just don’t expect to grasp this piece in one spin. It’s impossible. It’s already a third day that I’m listening to this opus and I’m still far from saying I know “Death’s Design”. 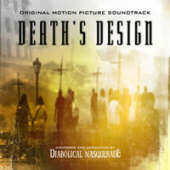 Bottom Line: If indeed this music was meant to be a movie soundtrack, “Death’s Design” would made it an instant classic, if not, it’s a music masterpiece nevertheless. Either way you look at this, as a regular CD or a soundtrack, you have to have this release.